All your controls are where you can reach them. 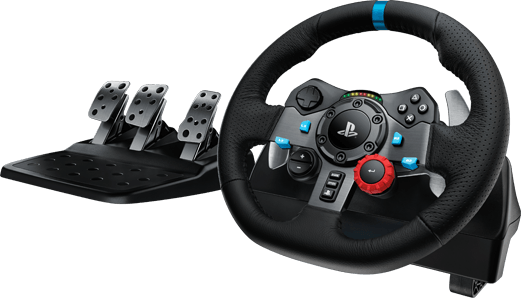 The D-Pad, buttons and paddle shifters are incorporated into the racing wheel. LED indicator lights positioned just above the center of the wheel tell you exactly when to up- or down-shift. You maintain maximum acceleration without taking your eyes off the track. A 24-point selection dial and the +/- buttons on the front of the wheel let you further fine-tune your driving preferences.<br /> Feel your tires on every turn and type of terrain, sense under- or over-steer drifting and more. Powerful dual-motor force feedback realistically simulates force effects so you can respond with precision.<br /> Driving Force handles the stress of racing action and is built for long-lasting reliability. G29 has solid steel ball bearings in the wheel shaft and stainless steel paddle shifters and pedals. The race wheel is covered in high-quality, hand-stitched leather, giving it the look and feel of a high-performance race car wheel and giving you a more comfortable, durable experience. Bought this from FirstShop to try before buying the Thrustmaster T300RS. Excellent wheel with great force feedback. FFB is a little notchy and loud at times but not a dealbreaker. Great starter wheel that includes an excellent set of pedals.